Klein Cain is one of the state's newest schools, but the Hurricanes already have one of the state's biggest fighters in their ranks. Klein Cain junior Jacob Munoz was preparing to return to the football field after defeating Philadelphia Chromosome Positive Acute Lymphoblastic Leukemia in a two-year battle with the cancer, when he got the news last December. He had relapsed. Munoz immediately went back into inpatient care and began another fight for his life against the aggressive cancer that was in his bone marrow and had already spread to over 70-percent of his spine and brain. Jacob underwent 10 rounds of chemotherapy and didn’t get a response. Prior to the 11th round, the doctors informed Jacob and his mother that if the chemo didn’t give a response, they would need to move to their last resort — putting a catheter into his brain. After a vicious fight, Munoz was able to get back into remission and thus, was able to receive a bone marrow transplant. Fortunately, Jacob’s younger brother, Christian, who was 11 years old at the time, had bone marrow that was a 10/10 match and stepped in to help save his brother. Jacob successfully received the transplant in March and has been on the long road to recovery since then. He remains on preventitive medication but has returned to school full-time. Despite the constant ups and downs of the process of Jacob’s journey, Yvette says that two things stand out with Jacob that have remained the same: his unwavering fight and his burning desire to get back to playing the game that he loves. “He has been such a warrior this whole time,” Munoz said. “He wants to get back on that field so bad. It’s his love and every day he does everything he can to be back out there. Though undergoing treatment, Jacob kept a calm and steady mindset and leaned on his faith in God, to get him through the tough times. Though he started off his high school career at Klein, Jacob was redistricted to Klein Cain when the new school opened the summer before his sophomore year. Throughout the entire process, he was surrounded by a community of people who supported him, including his football team. Jacob’s teammates and coaches made consistent visits to the hospital to check on him and let him know that they were there for him. The team organized visits where teammates would come and bring him his favorite food — Whataburger. The team left all of his equipment in his locker, allowed him to vote on team captains and Facetimed him. With the toughest parts of his recovery behind him — Jacob and his family want his story of recovery to be one of encouragement for others, and that they too can complete the long journey to recovery. Jacob has been able to take part in some practice activities but is still working on getting healthy enough to be able to return to the football field. 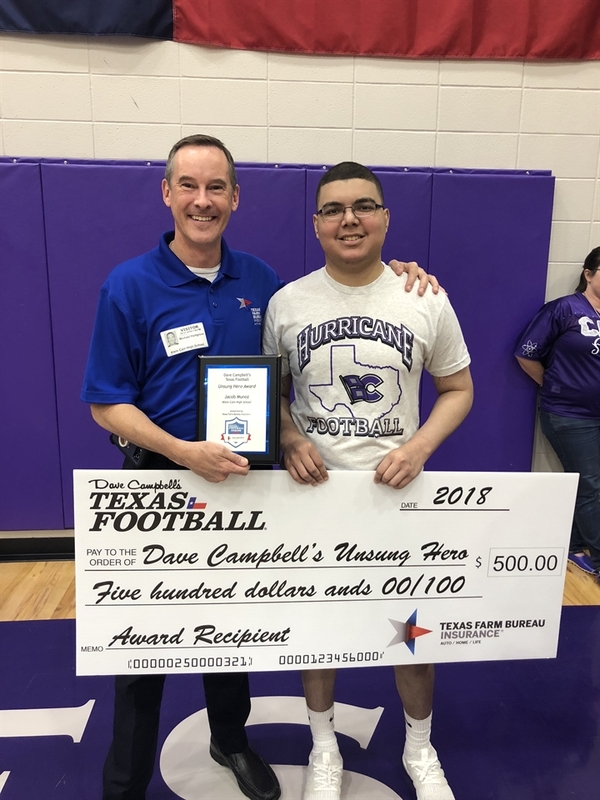 Klein Cain took on his former school Klein on Friday night and Jacob was honored at the game with the Dave Campbell’s Texas Football Unsung Hero Award presented by Texas Farm Bureau Insurance. The award included a scholarship to the university of Jacob’s choice. Jacob was honored to receive the award but can’t wait for the day that he is able to step on the field with pads on and able to play in a game with his teammates. Though it's unknown at this point when Jacob will be able to play in games, Jacob’s mother says that with Jacob’s work ethic, he could be able to play in a game sooner rather than later.